n this file picture taken 16 December 1971 in Dhaka, Indian Lieutenant General Jagjit Singh Aurora (L) watches as Pakistan's eastern forces commander General A.A.K. 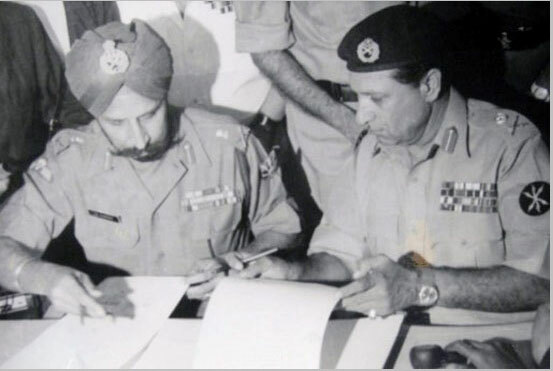 Niazi signs the treaty of surrender of the Pakistani army to Indian troops. Much was achieved by psychological warfare methods, which was used as a support weapon by the Armed Forces in the conduct of the war. This was done both in the battlefield as well as through the airwaves and newspapers. According to estimates, Pakistan had nearly four divisions in its eastern wing. Three divisions were deployed along the border with India, to plug the main arteries that converged into East Pakistan. The presumption of Pakistan military was that if the roads were blocked, the Indian Army would not be able to negotiate the rivers and reach Dacca. Meanwhile, international pressure would force India to continue the status quo. The strategy of the Indian Army was to avoid the highways and negotiate the rivers to cut the rear of the Pakistan Army. The Indian Air Force neutralized the Pakistan Air Force in its eastern wing during the first two days of the war, and the Sea Hawks of Indian Navy's aircraft carrier INS Vikrant flattened the landing sites at Chittagong and Cox's Bazar.